2015 July | Federation of North-American Explorers | Semper Parati! Ave Maria FNE (with a Timber Wolf Den for boys) in Ave Maria, Florida. 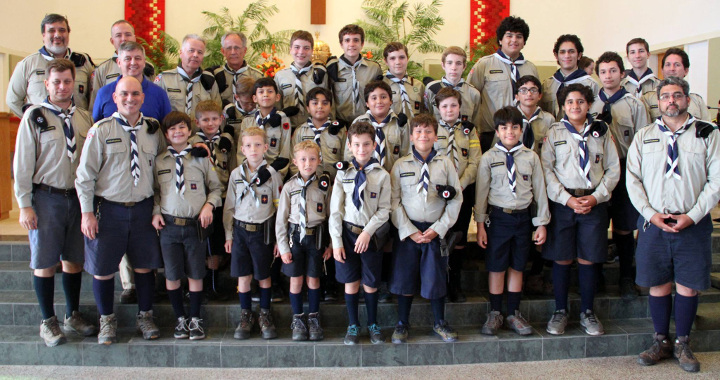 Crusaders of the Holy Cross FNE (with Timber Wolf and Explorer units for boys) in Atlanta, Georgia. To learn more about the Federation of North-American Explorers, please visit our national web site at www.fneexplorers.com, and contact our general commissioner Paul Ritchi at info@fneexplorers.com with any questions. The code of the medieval knights has been the foundation for the conduct of gentlemen ever since the day around A.D. 500, when King Arthur made the rules for his Knights of the Round Table. The romance of the Knights has its attraction for all boys and has its appeal to their moral sense. Their Code of Chivalry included Honour, Self-Discipline, Courtesy, Courage, Selfless Sense of Duty and Service, and the guidance of Religion. They were never to put off their armour, except for the purpose of rest at night. To defend the poor and weak. To give help to any who should ask it in a just quarrel. Not to offend one another. To fight for the defence and welfare of their country. To work for honour rather than profit. Never to break a promise for any reason whatever. To sacrifice themselves for the honour of their country. The ideals of the Knights and the idea of fair play is above all the one which can be best instilled into boys and leads them to that strong view of justice which should be part of their character, if they are going to make really good citizens. This habit of seeing things from the other fellow’s point of view can be developed in outdoor games where fair play is essential, whether it is in “Flag Raiding” or “Dispatch Running.” During the game the strictest rules are observed which mean self-restraint and good temper on the part of the players, and at the end it is the proper form that the victor should sympathise with the one who is conquered, and that the opponent should be the first to cheer and congratulate the winner. This should be made the practice until it becomes the habit. A further valuable aid to the training in fairness is the holding of debates amongst the boys on subjects that interest them and which lend themselves to argument on both sides. This is to get them into the way of recognizing that every important question has two sides to it, and that they should not be carried away by the eloquence of one orator before they have heard what the defender of the other side has to say on the subject, and that they should then weigh the evidence of both sides for themselves before making up their mind which part they should take. A practical step in ensuring this is not to vote by show of hands, where the hesitating or inattentive boy votes according to the majority. Each should record his vote “ay” or “no” on a slip of paper and hand it in. This ensures his making up his mind for himself after duly weighing both sides of the question. In the same, way mock trials or arbitration of quarrels, if carried out seriously and on the lines of a law court, are of the greatest value in teaching the boys the same idea of justice and fair play, and also give them a minor experience of what their civic duties may be as jurymen or witnesses later on. The Court of Honour in the Troop is another step in the same direction, and as the boys here have a real responsibility by being members of the Court, the seriousness of their views is brought home to them all the more, and encourages them to think out carefully the right line to take when they have heard all the arguments on both sides. FNE comes to the Volunteer State! Please welcome Tennessee to the FNE family! By approval of our general commissioner, we are pleased to announce the formation of 1st Holy Family FNE, St. Joseph Explorer Troop and Timber Wolf Den in Memphis, Tennessee. Prayers and a big welcome to our new brothers in the South!